The accusation has long bedevilled the first albums of the adventures of the popular Belgian comic book character. Tintin in the Congo, with its patronizing portrayal of Africans, has long been cited as an example of outdated views on race. But it is now the third volume in the series, Tintin in America, that has made the news, after complaints in Winnipeg led to its temporary removal from a Chapters bookstore. Following the uproar last weekend, the Winnipeg Public Library said it was also reviewing whether to keep Tintin in America in its collections and reorder it. Tintin in Congo was already pulled from main circulation in 2006 and not reordered. Ironically, Tintin’s creator, the late Georges Remi – better known under the pen name Hergé – felt he had affinities with native people, because he favoured underdogs. One of his biographers, Michael Farr, noted in his book The Adventures of Hergé: Creator of Tintin that Hergé dressed up as a Plains Indian while a teenaged boy scout in the 1920s. 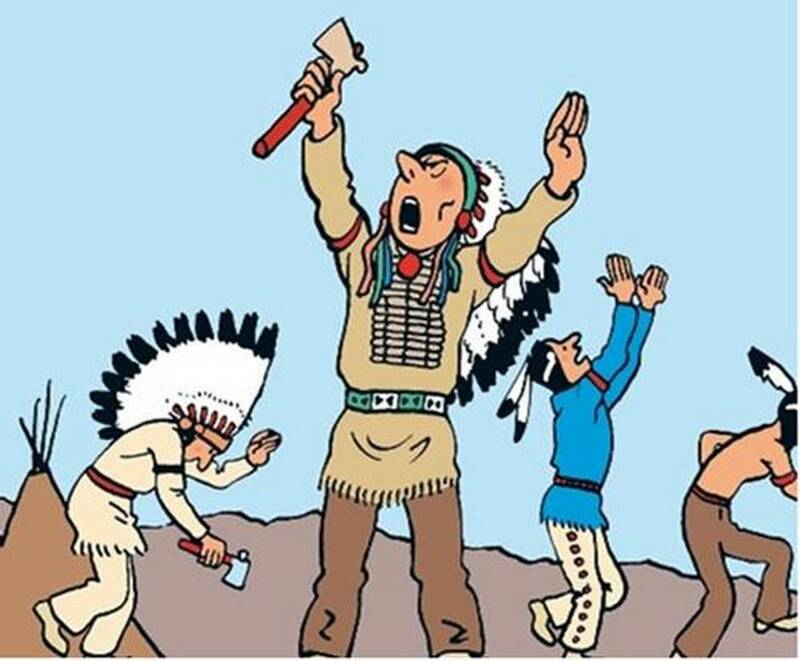 Scowling, waving tomahawks and using words such as “squaw” and “paleface,” the native people in Tintin in America belong not so much in the 1930s, when the album was first published, but in the 19th century. At the same time, the album includes a moment of sympathy for natives that wouldn’t be out of place today. After Tintin discovers an oil gusher, businessman show up and bid thousands of dollars for the exploitation rights. When Tintin points out that the oil is on Blackfoot land, the native chief is only offered $25 and given 30 minutes to leave. The next panel shows the natives being expelled at gunpoint. Hergé was an unwordly 22-year-old who had never left Europe when he started drawing comic strips for Le Petit Vingtième, a Belgian Catholic periodical, in 1929. By Hergé’s own admission, Tintin started as a conservative, right-wing character. “He was a reporter for a Catholic journal,” Hergé explained in an interview 50 years later. The panel was amended in later editions so that Tintin is instead offering a math lesson. Similarly, a panel in Tintin in America with a thick-lipped black doorman was discreetly tweaked in later editions. Hergé’s views changed markedly in 1934 when he became friends with an art student from China, Chang Chong-Chen. The following Tintin album, The Blue Lotus, was hailed as a turning point in Hergé’s work, as he tried to move away from stereotypes. The album is pro-Chinese and critical of Japanese imperialism and European colonial attitudes. 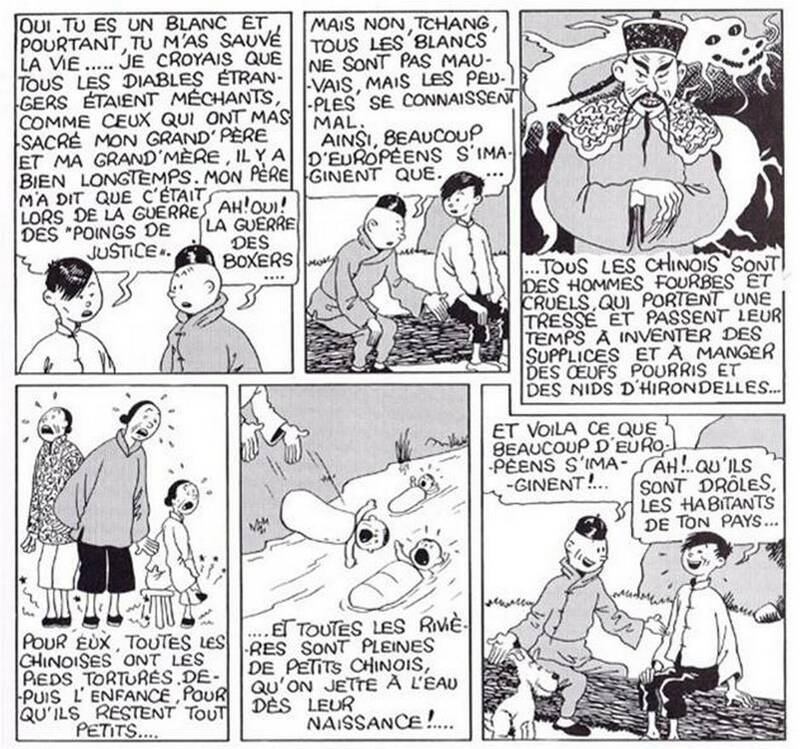 Tintin befriends a Chinese boy named Chang and discusses the misconceptions Westerners hold about China. But even later albums still have problematic content. In 1956, Hergé started serializing The Red Sea Sharks (better known by the French title Coke en stock). In it, Tintin and his friend, Captain Haddock, rescue African Muslim pilgrims from modern-day slave traders. Again, the black Africans are portrayed as pidgin-speaking and unintelligent. The album also features an encounter that wouldn’t be out of place in current political news. 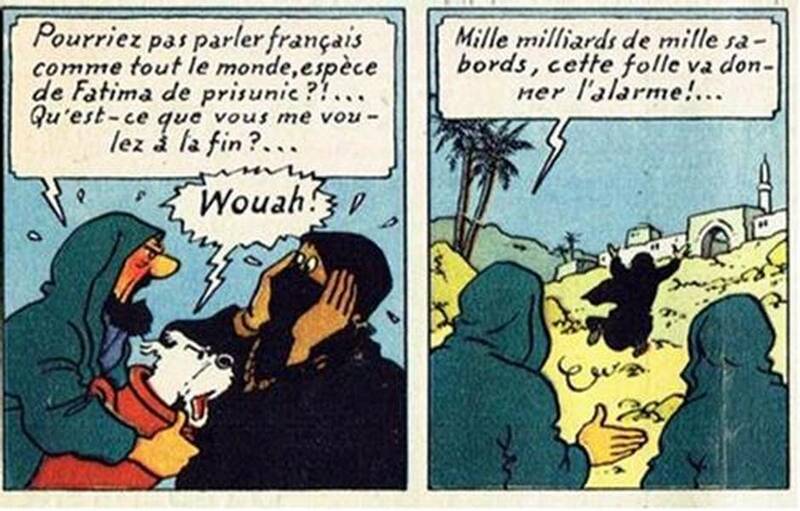 Tintin and Haddock travel to a fictional Middle Eastern country where they have to disguise themselves with veils, but are unmasked by a woman in a niqab. “Couldn’t you speak French like everyone?” an irate Haddock yells at her.